Launched today, the backdrop of the Cold War provides the RPG game Phantom Doctrine its needed spice for spies. The beautiful graphics, icy setting work, conspiracies and a conflict ridden world is just the right thing for X-COM fans. Welcome to the world of intelligence and some fluid mechanics. As a player, you are part of the Cabal group. A conspiracy team, whose mission is to lead the world and to control world leaders. You become your own party when the west is pitched against the east. Severely outnumbered and out weaponed, you are thrust in a game of manipulation and deceit. The game is filled with thrilling moments of sneaking into embassies and taking out other services and agencies that do not work for the betterment of the world. As a player, your part is in unraveling and defusing a plot. Phantom Doctrine is a fusion of combat and spy skills. Though mainly the game can be played in the single player mode, it also offers you to play and compete with other spies across the world. These matches can be played across five world maps. You can confer around the planet with friends from different regions to play this multiplayer match. It is also a great way of meeting fans of the game and making new friends. 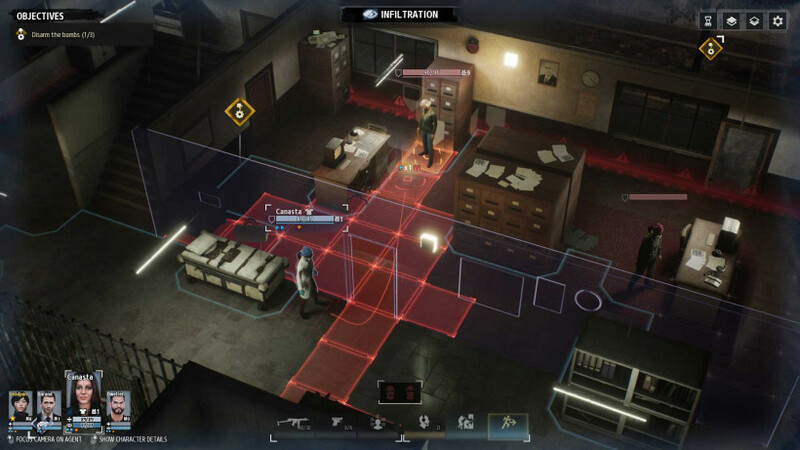 To win a multiplayer match, however, demands an extensive use of the tactical skills offered by Phantom Doctrine. In Phantom Doctrine, there is a world map from where you can keep track of spy positions and a base. Here spies will be recruited, hide out and interrogations will take place. Working in the favor of the world and against major forces whose best interests do not lie with the world is a hard task. But not when you have the best possible team of agents and spies. Though they are considered as terrorists, this team is your only chance at saving the world from disintegrating into complete chaos. Force might appear as a great skill in videogames. But this virtual world requires the finest tactics in surviving the ruthless and the macabre. That is where your team of players comes in and save the day. In Phantom Doctrine, there are three points from where spies can begin. They can be situated as a part of your team. Or they can be ordered to go undercover on the world map. You can order them to kill enemies, steal or forge documents, or they could simply act as informants. Or they can work as snipers and shooters on the edges of the world map. In this way, they have always had your back and are in touch with your blind side. The best part is the conspiracy board. Where you pitch in ideas as you slowly unravel the mission you initially set out on. The producers are attempting to find the perfect balance between proactive and reactive gameplay in Phantom Doctrine. It is the perfect game for those who wish to delve more into stealth, tactics, and conspiracies rather than bashing heads and violence. This is the game for the subtle for the stealthy and gives off the vibe that knowledge is power in an unsteady world.